What happens when two people from opposite sides of the world find common ground to communicate? For Starbucks at least, a few barriers were broken after introducing to some of its stores a better way for hearing impaired baristas to communicate. 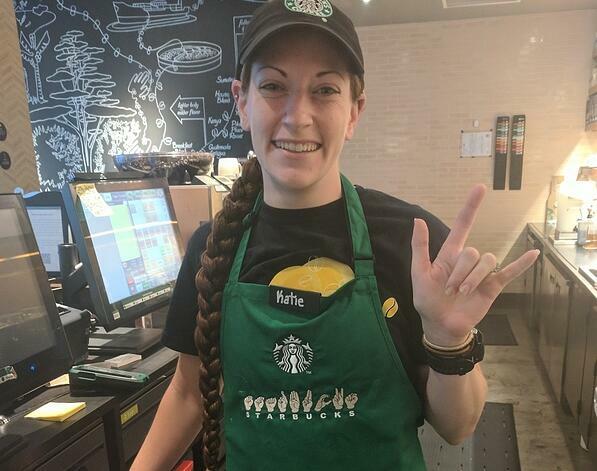 Starbucks recently announced the rollout of sign language aprons, embroidered by a deaf-owned business, that are now adorned by 50 hearing-impaired Starbucks employees throughout the U.S. The idea for the aprons culminated from two Starbucks stores on opposite sides of the globe—one in Washington D.C. and the other in Malaysia. Katie Giles, a deaf Starbucks barista in the U.S. was encountering challenges at her Starbucks store with communication among employees and customers. While she could have found another job, she instead set out to explore ways to improve Starbucks for everyone. With support from Adam Novsam and Marthalee Galeota—partners at Starbucks’ Seattle headquarters—Giles connected with a Starbucks store in Malaysia where employees were wearing aprons with “Starbucks” embroidered in finger spelling across the front. Novsam, a deaf business analyst with Starbucks Facilities and Environmental Performance Management team, learned how the aprons were made and found inspiration to create them in the U.S. Then, Galeota enlisted Maryland-based graphics embroidery business, EmbroidMe, (owned by Angie Foster, who has been deaf since birth) for the apron project. Since the development of that first order, Starbucks has turned to another talented deaf woman, Sevana Massih, district manager in Berkeley, CA, to develop a distribution system for the aprons. At the end of the day, Giles can celebrate the movement she has largely initiated. She speaks of her experience and the change the aprons are bringing to Starbucks as follows: “People are curious and tend to look at me with more of a friendly face when they enter my store and see me in the apron. I’ve even learned that some of my customers know a bit of sign language, which they had not used because they didn’t know I was deaf. My relationship with customers has totally changed.” Read more here.